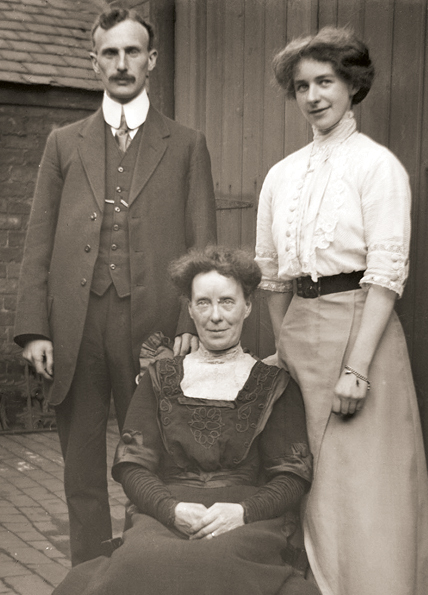 Frederick Blanchard was Headmaster of Blue Coat Senior School for many years and also a prolific photographer, a member of Walsall Photographic Society. His daughter Freda, also a teacher but at Blue Coat Infants and Junior Schools was also a member of the Society some years later. During his lifetime he took thousands of photographs with a plate camera in the early days and later film camera. 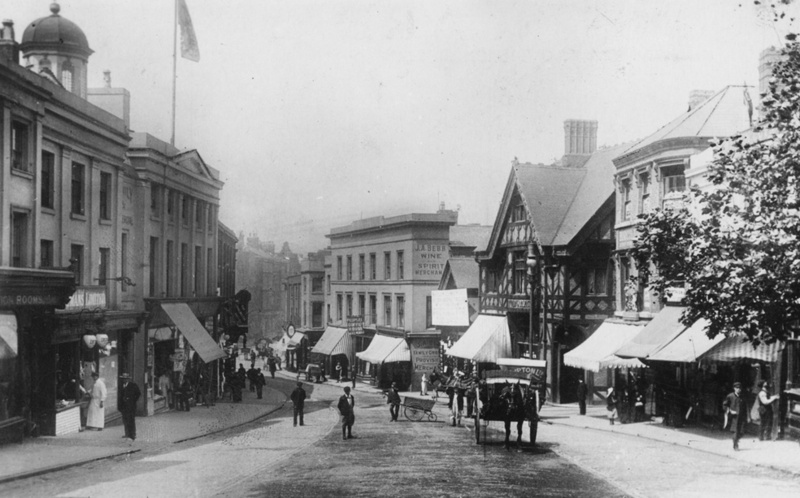 Around 1920 Frederick took six photographs on glass negatives showing various buildings in Walsall town centre very late at night. The images have an eerie look about them and it makes one wonder who…. or what lurks in the shadows? Plate cameras were bulky things to lug around and taking photographs with them, even in good light was tricky so to do this in darkness was the ultimate challenge. Frederick didn’t make a bad job of it as you will see, only one photograph suffered from some camera movement. The first of the six images shows the building that was opened in 1831 as a library and many years later housed the County Courts. The upper floor was used a Freemason’s Hall and occasionally as a venue for music concerts. 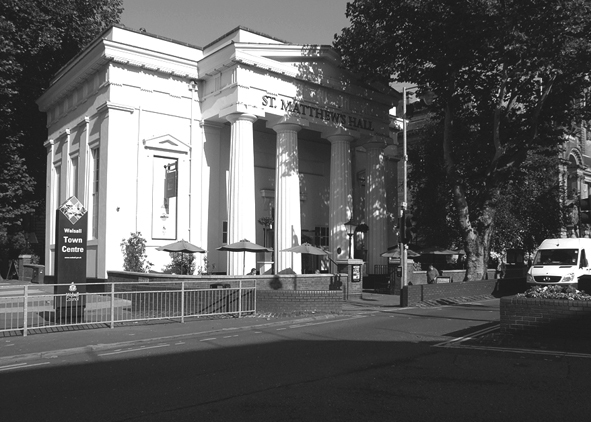 After extensive renovation 2011 it opened as St. Matthew’s Hall under the J. D. Wetherspoon banner which is shown below. The next image is of the statue of Sister Dora that stood in between the public conveniences on The Bridge. A few scuff marks on the negative tarnish this picture a little, but nevertheless another atmospheric cracker! In the background can be seen the Observer buildings. Below and moving just a few feet away from where the above shot was taken, Frederick then took a shot of the pillars which embellished the facade of the George Hotel. These columns were originally used at Fisherwick Hall near Lichfield, they remained at the George until its demolition in the 1930s, the new George Hotel opened in 1935. As a boy I can remember seeing these columns lying in a field in Gorway Road at the site of Walsall Council Parks Department offices although I didn’t know this at the time. The daytime image left is of similar vintage to the nocturnal shots above shows the view looking towards the statue and George Hotel and Sister Dora’s statue. There is no way that Frederick would have missed the chance of taking a photograph of arguably Walsall’s most iconic landmark….the market…..and sure enough he didn’t. This, sadly, is the only image affected by movement of the camera. Looking closely one can just see a slight double image when the camera was moved, but still a great shot. The tree in the right foreground is still there, one of the few items left that link the present day to almost one-hundred years ago! The Woolpack had long closed its doors when this picture was taken and the last of the drinkers had staggered off into the night. Frederick, like all good photographers, made sure there was no passers-by around who could cause further blurring to the image. 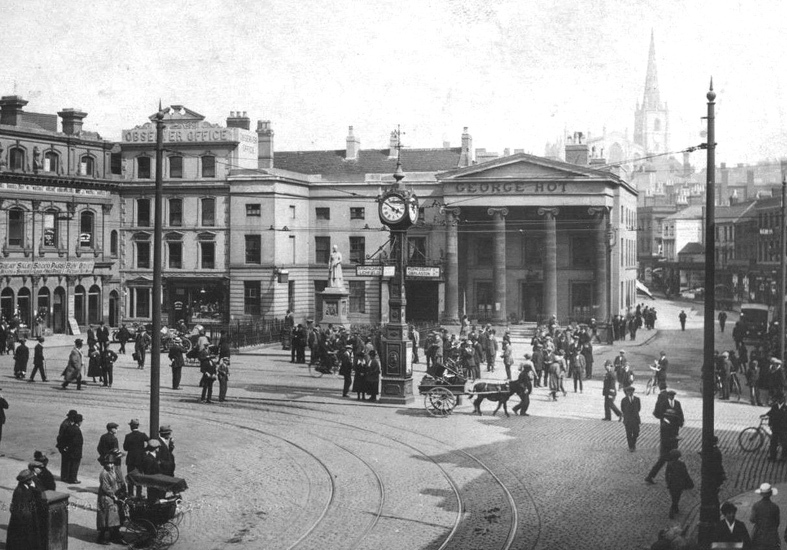 The image below shows a similar view c.1910, the foliage of the tree is seen on the right and on the left, the dome of the old bank that later became the Carlton Hotel. On a cold damp night, a little further up High Street, Frederick set up for his next shot which shows the view down Goodall Street. The Guildhall building, which remains today, but back then was home to the Magistrates Court and Walsall Police Station. The lamp that glows over the doorway is the only sign that the building isn’t shut too. 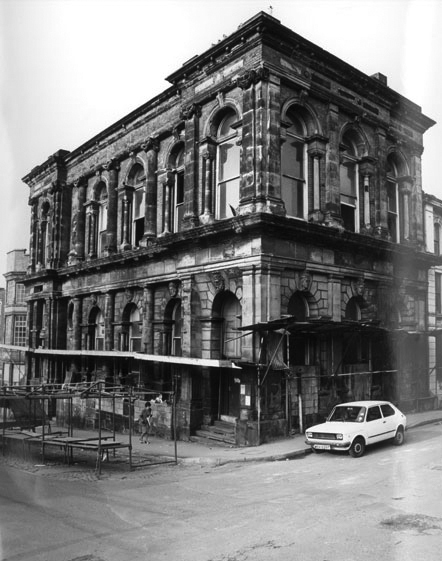 The image left is from 1982 and shows the building has changed little over the years. Courtesy of Walsall LHC, ref. no. w12151. 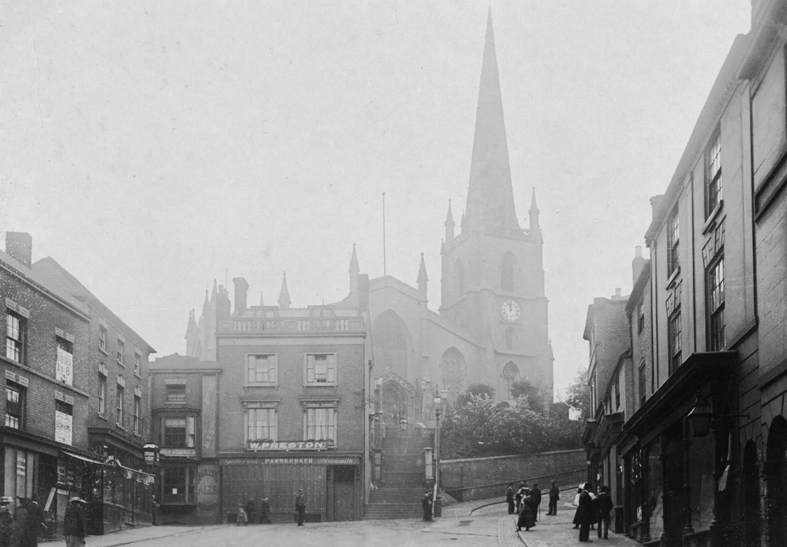 The final image was taken after Frederick had reached the top of the market and set up his camera to record this atmospheric shot of the steps up to St. Matthew’s Church. It would appear the camera is actually in the middle of Upper Rushall Street, with not that much traffic about in those days or that time of night I don’t think Frederick would have been too concerned. The building to the left of the steps was Prestons, the pawnbrokers and I think later became Hillans the drapers before being demolished in the 1950s. The picture above shows a similar scene in daytime around 1910. Just seeing this photograph immediately brings to mind Sir John Betjeman’s words that Walsall’s High Street could have been one of the great high streets of England. Sadly there is little left of the original buildings shown. You are currently reading After dark in Walsall c.1920 at Walsall Life.